Jimmie Johnson made history Sunday with the 83rd win of his career. He wasn’t the best car all day, but led when it mattered. 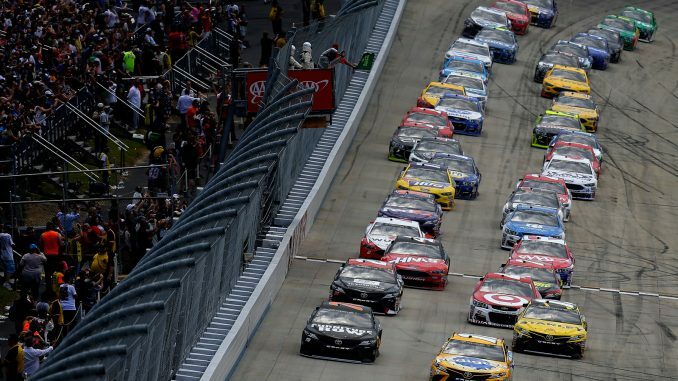 Here’s how it all went down at Dover Sunday. From his first career Dover pole, Kyle Busch led the field to the green. Martin Truex Jr. started second on the outside. Daniel Suarez, Matt Kenseth and Kyle Larson rounded out the top 5. Jimmie Johnson who qualified 14th, was forced to start of the field after his crew changed a gear. Busch had a clear lead by turn 1 Truex fell in behind for second, Suarez was third. Kurt Busch had fifth by lap 4 as Kenseth was falling back. Larson held station in fourth. The lead for Busch was 1.1 seconds by lap 8. Kenseth had fallen to seventh. Larson took third on lap 14. Busch began lapping the field on lap 15. Ryan Sieg, making his NASCAR Cup debut spun in turn 2 on lap 16 and the first caution of the day came out. The leaders pitted. Kyle Busch was out first, Truex followed; Joey Logano took only two tires and came out third. Suarez and Larson followed. Exiting the pits, the left rear wheel on the Kyle Busch car came off and he was forced back in. Ricky Stenhouse Jr. did not pit and inherited the lead. Busch restarted in the back as the green came out on lap 22. 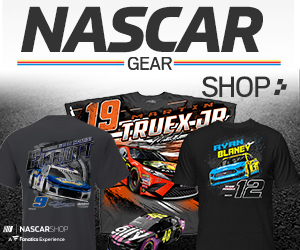 Truex with fresh tires powered by and took the lead. Logano with two tires was also getting passed; Kurt Busch and Suarez got by as did Brad Keselowski and Larson and Logano was seventh by lap 27. Kyle Busch was still on the lead lap, running fine in 28th and moving up. Stenhouse with old tires was holding on to second. Kurt Busch took second on lap 33. Suarez was fourth, Larson fifth behind Stenhouse by lap 40. The second caution came out on lap 47 when Stenhouse’s good run came to an end when he hit the wall after losing a right front tire entering turn 1. The leaders pitted. Larson took two tires and was out first, followed by Truex, Kenseth, who also took two, Kurt Busch and Suarez. Chase Elliott was penalized for speeding, Denny Hamlin for an uncontrolled tire. Green came back out on lap 52. Larson took the lead, Kurt Busch got by for second. Johnson was back inside the top 10 in ninth. Kyle Busch was 16th. Keselowski had fourth by lap 55 as Suarez was dropping back. Johnson took seventh from Suarez by lap 57. Stenhouse hit the wall again, this time exiting turn 4 on lap 62 and caution three came out. He was able to take the car to the garage. The leaders stayed out. Green came out on lap 64. Larson and Kurt Busch were side by side entering turn 1; by turn 2 Busch was loose; he got into Keselowski knocking him into the wall; Busch spun, Keselowski continued, caution four came out. Heavily damage, Keselowski rolled to the garage. Again no one pitted and the green came out on lap 70; Larson took the lead, Truex fell in behind to second. Kenseth was third, Kevin Harvick was fourth, Johnson fifth. Kyle Busch had moved to eighth. Harvick took third on lap 75; up front, Truex was looking for the lead. The two ran side by side, Larson high, Truex low for several laps. Larson got loose entering turn 3 on lap 80 after a shot by Truex, and Truex took the lead. Harvick took second a lap later, Johnson followed for third. Kurt Busch lost a left rear on lap 97 entering turn 1; the car hit hard and was destroyed, caution five came out. The top three stayed out many behind pitted. On the restart on lap 104 Truex led followed by Harvick, Johnson, Trevor Bayne and Chris Buescher. Truex shot to the lead. Those with new tires quickly began moving up. Harvick held onto second, Johnson third. Kenseth took fourth on lap 106, Larson took fifth. Kenseth and Larson were soon fighting for position. Those two were soon at the rear of Johnson. Larson took fourth on lap 114; Kasey Kahne was looking for fifth from Kenseth. Larson took third on lap 116, shortly he had second from Harvick. Kenseth followed a lap later and Johnson was fifth. Top 10 Stage 1: Truex, Larson, Harvick, Kenseth, Johnson, Kahne, Ryan Blaney, Erik Jones, Kyle Busch, Suarez. Caution six was displayed. The leaders pitted. Truex was out first, Joey Logano who took fuel only was second, followed by Harvick, Johnson and Austin Dillon who took only two tires. The top 12 however stayed out. Green came out on lap 128; Larson who stayed out took the lead, Blaney was second, Kenseth third, Kyle Busch fourth, Kahne fifth. By lap 134, Larson had a lead nearing two seconds. Kenseth took second on lap 138. By lap 140, Larson’s lead was 3.6 seconds and growing. Truex had moved to fifth by lap 143; Johnson close behind. Danica Patrick spun on lap 145 and caution seven flew. The leaders all pitted. Larson was out first, followed by Kenseth, Busch, Truex, and Johnson. Green came out on lap 151; Michael McDowell stayed out to lead. Larson shot by, Busch soon had second; Truex followed and soon McDowell was falling back. The lead for Larson was 2.7 seconds by lap 163. Logano in 11th lost a tire and hit the wall in turn 4 on lap 194 and caution eight came out. Green came out on lap 198. Larson spun his tires but hung tough and was able to take the lead from the outside over Truex. Johnson was third, Busch fourth, Kenseth fifth. Truex had caught Larson and was looking for the lead by lap 209. Johnson was close behind the two. Truex had the lead on lap 211. Caution nine came out on lap 219 when Landon Cassill lost a tire and hit the wall. Truex, Johnson, Busch and others among the leaders stayed out, the rest of the leaders all pitted. Larson who pitted restarted 19th. Great came out on lap 222. Larson was charging forward going two and three wide. The top five: Truex, Johnson, Kenseth, Busch, Harvick. Larson was seventh by lap 229. He was sixth two laps later. He was fifth with two laps to go in stage 2. Top 10 Stage 2: Truex, Johnson, Kenseth, Busch, Larson, Harvick, Elliott, Blaney, Jones, Kahne. The leaders all pitted during caution 10. Off pit road, Larson, who took 2 tires, was out first followed by Truex, Johnson, Kenseth and Busch. During the stopes Blaney broke an axle and was forced to the garage for repairs. He came back out two laps down. Truex nearly spun, Johnson shot by and took second as Larson took the lead. Kenseth was fourth, Harvick fifth. Johnson was looking for the lead on lap 254; the two touched and Johnson fell back, and he and Truex made contact. Kenseth just behind took advantage and grabbed third. Up front Larson began to pull away. Caution 11 came out for debris on lap 263. The leaders stayed out. Green came out on lap 267. There were 23 cars on the lead lap. Larson took the lead, but Johnson was soon on the inside. He held off Johnson as behind Truex was defending from Elliott; Kenseth was fifth. Kenseth had a flat tire on lap 286 and dove into pit lane. He was penalized for speeding and a commitment line violation. With 100 laps to go, the lead was over 2 seconds as Johnson was held up by lapped traffic. Truex took second on lap 305 as Johnson reported a possible issue a few laps after a brush with the wall; Elliott took third from Johnson two laps later. Jones pitted with a flat right front tire on lap 313. Harvick took fourth on lap 316. There were 18 cars on the lead lap. Busch took fifth from Johnson a lap later. Johnson continued to fall back. Truex pitted on lap 325 setting off a round of green flag stops. Larson pitted from the lead a lap later. Elliott and Busch followed. During the cycle, caution 12 came out with Regan Smith hit the wall on lap 329; Johnson was leading as he had stayed out. Larson in 10th got the free pass. Among those who had not pitted in addition to Johnson, Ty Dillon, Ryan Newman, Austin Dillon, Paul Menard, Buescher and Patrick. They all pitted; Ty Dillon came out first, followed by Newman, Johnson, and Austin Dillon. The top 10 on the restart on lap 335: Ty Dillon, Newman, Austin Dillon, Johnson, Dale Earnhardt Jr., Menard, Buescher, Patrick, Larson and McMurray. There were 16 wave arounds including Truex, who restarted 13th. On lap 343, Menard, Buescher and Larson were three wide in turn 2; Buescher got loose up and into Menard, sending him into the wall and down to the inside. Truex who had fallen to 15th was among the few who pitted. He had some slight damage. Caution 13 was displayed. Green came out on lap 348. Ty Dillon took the lead, Newman held second; Johnson was close behind. On lap 350, Larson caught Johnson and it was a three-way battle for second that include Newman. Earnhardt was fifth. Johnson had second by lap 353. Larson followed into third. Johnson was soon catching Dillon in the lead. Larson got to Johnson on lap 358 and took second. Busch reported a possible loose wheel and pitted on lap 359. It was only a matter of time, and Larson caught and passed Dillon for the lead on lap 360. Johnson followed to take second. With 28 laps to go the lead for Larson was just over a second. There were 16 cars on the lead lap. The lead was 1.5 seconds with 15 to go. Ty Dillon held steady in third. Truex had fought his way back and was fifth and looking for fourth. With 10 to go the lead was 2.2 seconds. Truex got fourth with 9 laps to go. Truex took third with 4 laps to go, just as David Regan hit the wall and caution 14 came out. It setup a green-white checkered flag finish. The top six stayed out; Earnhardt and others behind pitted. Earnhardt was nailed for speeding. Those top six: Larson, Johnson, Truex, Ty Dillon, Newman and Jones stayed out. Larson took the outside on the restart, Johnson on the inside. Dillon and Truex were just behind. Johnson took a slight lead as Larson fell into second; behind a huge crash erupted when Ty Dillon was spun after contact with Newman along the back stretch, in all eight cars were involved. NASCAR ruled that Johnson had passed the overtime line and Johnson was declared the winner. Larson was second, Truex was third followed by Newman and Elliott. Suarez was sixth, Jamie McMurray seventh, Denny Hamlin eighth with Kevin Harvick and Patrick rounding out the top 10. Next up for the Monster Energy Cup series in the Pocono 400 at Pocono Raceway next Sunday.